The preview pages does feature a couple of pictures of stuff that isn't in the movie, or even the deleted scenes that were featured on the home media release. 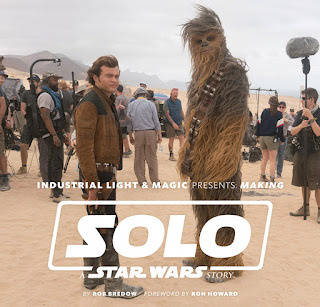 Given the troubled nature of the production, with directors Phil Lord and Chris Miller being replaced midway through filming by Ron Howard, it will be interesting to see what is included in the book. Most other tie-in material (home media featurettes, the Art of book) has avoided talking about the infamous directors switch, so it seems unlikely that Bredrow will address it too much in this new book. However, seeing as we're already seeing new things (and Lord and Miller actually appear and are named in the preview pages), hopefully there will be some more insight into what else we could have seen in the movie. Industrial Light & Magic Presents: Making Solo: A Star Wars Story will be released on April 16th. Author Rob Bredrow will be on hand at Star Wars Celebration Chicago in April to talk about the the book.